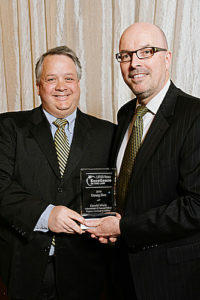 Gerald M. Miele, HCC administrator and financial officer, was recently honored by Rhode Island Lawyers Weekly with the publication’s inaugural Excellence in the Law Award. 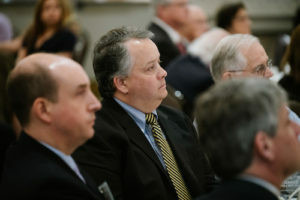 The program was conducted at the Downtown Providence Marriott on April 9th before a crowded audience of the state’s bench and bar. Governor Gina Raimondo served as the keynote speaker and heralded the achievements of all of the award recipients. Rhode Island Lawyers Weekly honored a diverse group of individuals representing a wide range of accomplishments within the legal community. Categories included up and coming lawyers, in-house counsel, leading practitioners, pro bono honorees as well as administrative personnel. Gerald Miele was recognized for a career that has spanned more than two decades of service to the legal profession as well as his most recent contributions as the administrator and financial officer at HCC which he joined in 2017. Susan A. Bocamazo, the publisher of Rhode Island Lawyers Weekly noted several specific accomplishments. On any given day, she said, Gerald Miele manages the firm’s finances, interacts with building contractors, negotiates with vendors, and oversees human resources and personnel matters. He is also responsible for upgrading the firm’s cybersecurity procedures and software systems and has developed new data recovery systems. In addition, he has taken a leadership role in improving the firm’s social media presence on Facebook, Instagram and Twitter, Ms. Bocamazo added. Finally, he was also recognized for his civic engagement as chair of the Rules Committee for US Figure Skating and as a board member and coach for Smithfield Youth Soccer. HCC was a proud sponsor of this event.